New 2017-18 Game Dated Moments Packs for Week 10 are Now Available on e-Pack! 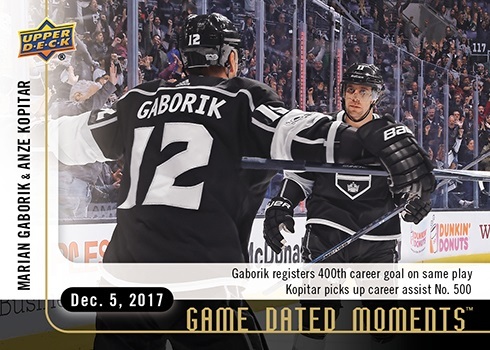 The Dynamic Duo of Anze Kopitar and Marian Gaborik helped each other reach a pair of milestones while leading the Kings to a 5-2 comeback win over the Wild on home ice. The Bread Man certainly knows how to deliver anywhere on the ice as he racked up five primary assists, one on every goal, of a 5-3 road win for the Blue Jackets. Lundqvist patrolled the net for his 419th win in his career with the New York Rangers, pushing him past Hall of Famer Tony Esposito for 2nd All-Time in goalie wins with a single team. 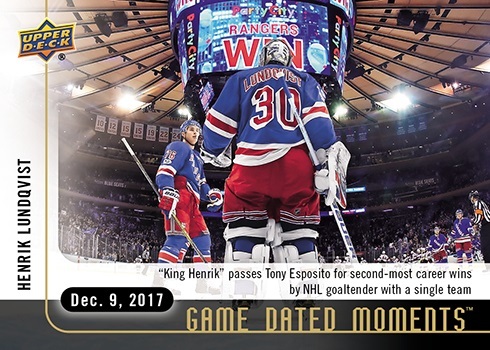 Check out the entire 2017-18 Upper Deck NHL® Game Dated Moments Checklist HERE. To purchase any of the current Game Dated Moment cards simply log in or register at UpperDeckEpack.com than click on the STORE tab in the upper corner of the site. Once there all Game Dated Moments packs will be locked and not available for purchase. To UNLOCK these cards, simply add at least one non-Game Dated Moment hockey pack to your shopping cart and automatically all the current Game Dated Moment packs will be unlocked and made available for purchase! Once unlocked you can add any of the Game Dated Moment packs you want to your cart and finish the transaction like normal. Upper Deck also asks fans to submit their favorite NHL hockey moments throughout the season for future Game Dated Moment cards by sharing with us on Twitter and using the hashtag #PickTheMoment. Upper Deck will use some of the most popular suggestions for future Game Dated Moment cards! Look for New 2017-18 Game Dated Moments Cards Every Friday Throughout the Entire 2017-18 NHL® Season! Head to the e-Pack Store Now to Grab the Newest Game Dated Moments Packs! *Packs will expire from the store the following Friday at 8:59 am (PST). **To purchase Game Dated Moments packs in the e-Pack store, you must purchase at least one other (non-Game Dated Moments) Hockey trading card product in the same transaction on e-Pack. Adding a hockey trading card product to your cart will unlock the Game Dated Moments product and allow you to add up to 99 of every available unique Game Dated Moments packs to your cart. There is no limit on the number of Game Dated Moments packs you can purchase, but only 99 of each pack may be purchased in a single transaction. Game Dated Moments cards may be shipped or transferred to a linked COMC account. However, this option will not be enabled until 3-4 weeks after the corresponding packs are expired from the e-Pack store. If you have a Game Dated Moments card in your collection on e-Pack when the option to be shipped has been enabled, you will receive an e-mail from e-Pack alerting you.